Me: I haven’t met you in person, Holly, but I feel like I know you. Here's a bit of “reader feeder” (in fiction, when your character tells someone something they already know for the sake of the readers): You emailed me out of nowhere and asked me if I would consider reading and possibly blurbing your first novel, A BLUE SO DARK. And I did, because I loved it. Now, that novel tackled some pretty weighty subjects. It really delved into mental illness, and how it affects those who have to live with a mentally ill parent. And yet when I see your photos and vlogs, you seem so bright and happy and…normal. (I’m sorry, I didn’t mean to insult you.) So here comes the classic author question. How much of this novel was drawn from life, how much from imagination? Holly: The short answer is that the book is completely fictitious. I don’t have any mental illness in the family—and I have no personal experience at all with schizophrenia. I know that leaves most readers wondering why I’d gravitate toward that topic, if it’s not something that’s ever had any kind of personal impact on me. What I actually wanted to write about wasn’t mental illness so much as the creative process—I’ve always been fascinated by creativity…why some people have innovative ideas seeping out their pores and others couldn’t get inspired to pick up a paintbrush or a pen or a camera once in their entire lives. I’ve always been intrigued by the idea of where creativity springs from—what’s the source? What makes one person creative and another not? When the book released, though, readers were eager to figure out what was real, what wasn’t. Because the book takes place in my hometown of Springfield, readers in the area wanted to know what “Crestview High” was, since there isn’t a Crestview in town. Quite simply, it’s a fictitious school. I didn’t want the book to take place in any of the schools here in town, because I didn’t want anyone to think I was writing about real people. Of course, even though the happenings of the book and the characters are both figments of my imagination, bits of yourself just naturally leak through when you write fiction—your humor, your own observations, they become part of each character you build. I think that’s why a book always feels so personal to a writer, even when it’s not based on something that happened, in life. You’re still revealing who you are through the creation of your fictional characters. Me: I haven’t yet read PLAYING HURT. I will. But I have to admit there’s something tugging me back. I tend to pull away a little from novels I perceive as centering around romance. All me here, no fault of your own. But I know the novel is probably so much more. So…tell me the more. Tell me why I want to read it even if watching two people fall in love is not enough for me. Me: People tend to assume that authors who have books published are widely read and doing great. And I hope you are! But tell us how the books are doing compared to how you hoped/thought they would. How much do you feel you are keeping a shoulder behind them with your own marketing and networking efforts? How much did people just seem to find them through reviews or word of mouth? Holly: I think it’s every first-time author’s secret (or not-so-secret) hope that their book will be an enormous breakout hit. But a first book is really hard, especially in such a crowded marketplace. There are so many great authors out there—and let’s fact it, money’s tight. It’s hard to convince readers they should spend their hard-earned cash on your book, instead of a book written by an established author they already know they love. My first novel, A BLUE SO DARK, snagged some accolades I never expected: it earned a starred review from Booklist, was named one of Booklist’s Top 10 First Novels for Youth (2010), and won both the silver medal in ForeWord Reviews Book of the Year and a gold medal in the IPPY Awards. I think all of those accolades have continued to renew interest in my book, convince some initially reluctant readers to pick the book up. My second book, PLAYING HURT, was a bit more…reader-friendly. The focus on a contemporary love story definitely expanded my readership. The book also, in some respects, made me seem more approachable. I received so many more letters, messages, etc. from readers with PLAYING HURT than I did when A BLUE SO DARK released. And nothing’s better than interacting with your readers! With A BLUE SO DARK, I really had a lot to learn, in terms of author-initiated promotion—I didn’t know anything about the blogosphere or social networking. (I drafted A BLUE SO DARK on a dinosaur of a computer that didn’t even have a modem!) I did do interviews and giveaways, of course, but I was really just beginning to learn how the whole thing worked. I was much more organized for PLAYING HURT—I did invest in some paid print advertising, as well as mailers to librarians and booksellers. I also sent the book on multiple review tours through the blogosphere, offering giveaways and interviews that were advertised on every social networking site I could find. Even my publishing house talked about the fact that it got really good attention online—but I really don’t think that, as an author, you can just cross your fingers and hope that word of mouth will take over. Attention doesn’t just happen on its own. You’ve really got to make it happen. Long story short, the awards and starred review my publisher was responsible for obtaining were powerful. The blogosphere is incredibly powerful, too, though—I’d argue every bit as powerful as trade reviews. And of course, no author is going to say the number of readers they have right now is enough. Everyone wants to grow and build their careers—I’m no exception. I realize now, though, that very few authors can tack the term “bestselling” to their names first shot out of the gate. A writer’s career has to be built step by step, book by book. Me: A few words, please, about your writing process. No holds barred. I really dislike first drafts—and middles. A first draft is a little like a live performance—it’s filled with nervous energy, and wondering how I’m going to pull off the idea I have in mind. A middle is like being onstage and knowing where the scene is supposed to wind up, but totally blanking on how you’re supposed to get there. Revision, though? Now, there’s my love. I adore revision, because that’s when I get to indulge in writing description and metaphor, etc., and I can relax because I’ve already figured out my maddening middle. I know how the beginning becomes the end. Me: Everyone who reads my blog knows I’m a dog lover. Nobody who knows me can miss how much I love Ella. Please tell my readers about Jake, and why/how much you love Jake. Holly: I had a long road to publication—took seven and a half years to get the first yes. After a couple of years of full-time effort, when I was still getting completely slaughtered with form rejections, I got Jake. Because of Jake, I took more breaks from my computer screen, got more fresh air and sunshine…got more laughter, too—a welcome break from drafting serious work—and I got more sloppy wet kisses when the rejections continued to pour in. Jake would be five years old when I finally snagged that elusive first yes. But having Jake really softened the blow of the rejections. Thinking and caring for Jake pulled my head out of my own frustrations. I’d definitely be lost without him. I always say Jake came from a breeder, and I’m the rescue dog. Holly: Where will you be in five years? Writing. Absolutely. The writing life is filled with so many highs and lows. Sometimes, I think that if you’re not just 100% passionate about writing—if it’s not something you just have to do—it’d probably be pretty easy to burn out. Knowing now how any writing career is filled with up and downs, I have to admit, I’m really glad that it took seven and a half years to get that first acceptance. I learned how to maintain a healthy sense of optimism through low spots—after seven-plus years spent writing books no one wanted to publish, I was either going to be optimistic or go all Sylvia Plath! But I also had enough time to realize that no matter how hard it was, no matter how tall the obstacle or how frustrated I felt, I was happy—because I was writing. Thanks so much, Holly! And for the giveaway, Holly is offering a PLAYING HURT swag pack (a signed bookplate, signed bookmark, and PLAYING HURT button) to a US or Canadian resident. Just comment below to enter and I'll choose a winner at random. 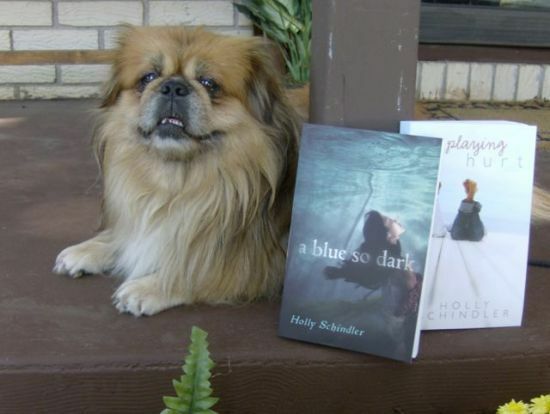 You can learn much more about Holly and her books at Holly's Website and her blog. While you're at it, follow Holly on Twitter or Google+ and become a Facebook Fan. 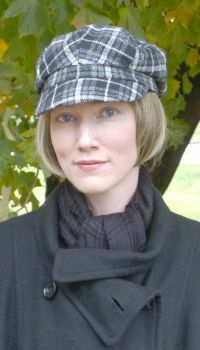 And Holly can be found on two group author blogs. One is YA Outside the Lines, which I am also part of, and the other is Smack Dab in the Middle. If that doesn't make you feel you know her, too, I'm out of ideas. This is going to be an every-Friday feature for quite a while. Please stop by next Friday for an in-depth discussion with Christopher Moore, author of THE STUPIDEST ANGEL, LAMB, and many, many others. AAAAAAANNNNNNNND...the winner is...Mag at Geek Chic! Thanks, Mag. You should be hearing from Holly soon.